CHENNAI: Fuelling speculations on possible political realignment in the State, former Union Minister and senior Congress leader EVKS Elangovan on Wednesday met DMDK president Vijayakanth on his 58th birthday and wished him a great political career. The meeting assumes significance in the backdrop of the latter’s invitation to political parties, sans the DMK and AIADMK, to form a third front in State. 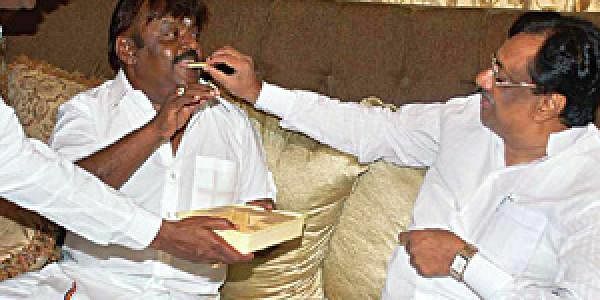 On his birthday, Vijayakanth had several other political leaders wishing him well besides Elangovan. CPI (M) State Secretary G Ramakrishnan, CPI State Secretary D Pandian and BJP State president Pon Radhakrishnan greeted him over phone. Birthday celebrations:&nbsp; Early on Wednesday, DMDK members began swarming Vijayakanth’s house in Virugambakkam to greet their leader on his birthday, which was observed as ‘Poverty Eradication Day’ by them. Accompanied by his spouse, Premalatha, and sons, ‘Captain’ offered special prayers, cut a cake and interacted with cadre.